Department of Pathophysiology, National and Kapodistrian University of Athens, Medical School, “Laiko” General Hospital, Athens, Greece. A 61-year-old man with a 2-year history of relapsing rheumatoid arthritis (RA), treated with abatacept, presented with dyspnea on effort and right pleuritic chest pain, progressively deteriorating during the past 2 months. On admission the patient had diminished breath sounds, decreased vocal fremitus, and increased dullness on percussion at the right lower lung field. 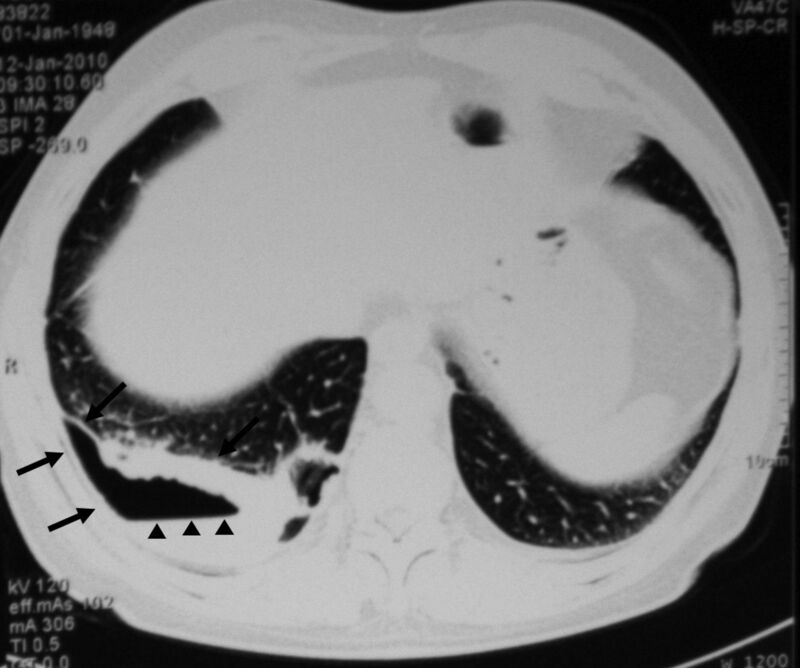 Right-sided hydropneumothorax was detected by computed tomography scan (Figure 1). Pleural fluid (PF) was drained and was macroscopically turbid and milky. Biochemical analysis of PF revealed low glucose level, extremely high lactate dehydrogenase, and elevated cholesterol, with relatively normal triglycerides. Stain, cultures, and amplification techniques for common microorganisms and mycobacteria were negative. 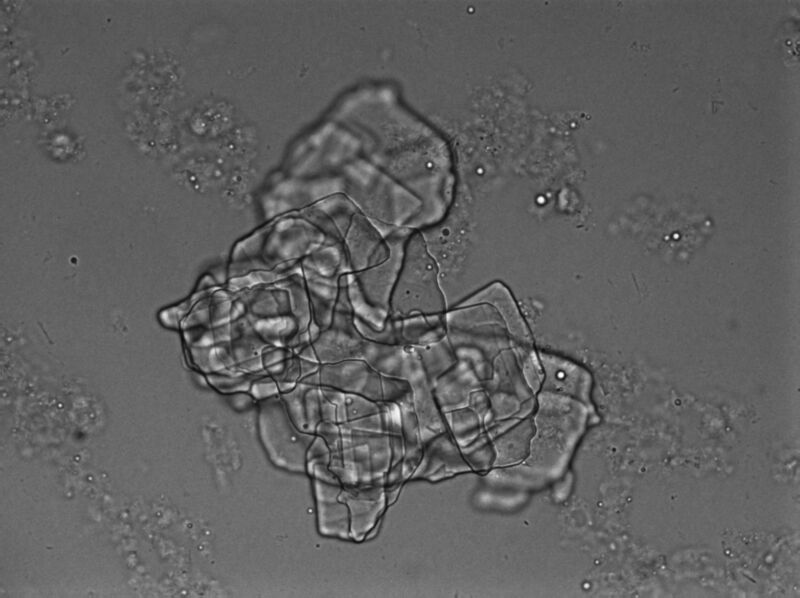 Microscopy revealed cholesterol crystals (Figure 2). Complete lung reexpansion was observed and maintained during the ensuing 7 years of followup. Thoracic computed tomography. Free fluid and air-fluid levels (black arrowheads) were detected in the right pleural space. Remarkable thickening of parietal and visceral pleura was also observed (black arrows). Optical microscopy of fresh pleural fluid sample. Cholesterol crystals presenting as multiple rectangular plates with a notch in 1 or more corners is a typical finding of pseudochylothorax (magnification ×40). Cholesterol-rich pleural effusion is a rare complication of RA1,2. Ethical board approval was not required in accordance with the policy of the authors’ institution. The patient gave written informed consent to publish the material.
. Cholesterol pleural effusion in rheumatoid lung disease. Thorax 1966;21:577–82. Characteristics of patients with pseudochylothorax-a systematic review. J Thorac Dis 2016;8:2093–101.